When missing most or all the teeth in an arch, tasks such as speaking and chewing become difficult. At Muntean Dentistry, Dr. Sorin Muntean provides full and partial dentures to restore the function and aesthetics of your smile. We provide both traditional and implant-supported denture options for restorations based on patients’ needs, and are committed to helping them achieve their smile goals. Schedule your Thousand Oaks denture consultation with Dr. Muntean by contacting our practice today. These dentures are secured with adhesive paste and the natural suction created by the roof of your mouth. This restoration provides enhanced ability to chew and is fabricated to look as natural as possible. Full dentures help patients to regain the confidence of a beautiful, complete smile. If patients are only missing teeth in one arch, dentures provided by our practice are matched to the shade of the remaining natural teeth. Before receiving your dentures, you will visit our office for an initial impression appointment, allowing us to create a comfortable restoration. Patients will then return for a try-in visit, where any adjustments are made to ensure patients are happy with their dentures. Partial dentures are held in place using a metal frame of cobalt-chrome. These frames are wear-resistant and clasp to the remaining healthy teeth. 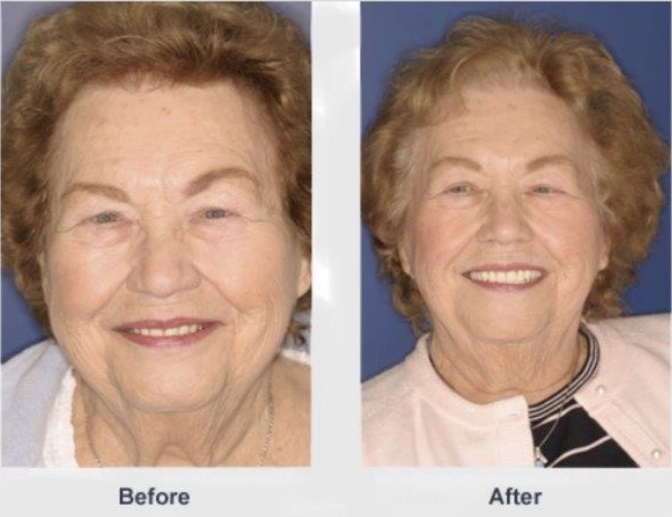 Many patients enjoy economical and conservative treatment with partial dentures, as well as how they seamlessly blend with the appearance of natural teeth. Dental implants provide the ideal form of restoration for patients missing one or more teeth. At Muntean Dentistry, we work with a team of periodontists and oral surgeons to ensure that implant placement achieves desired results. Implant-supported overdentures are stabilized by two or more implant posts and can be removed and cleaned in the same way as traditional adhesive dentures. Acting as artificial tooth roots, implants even support bone and facial structure, preventing the aged appearance associated with complete loss of teeth. Implant treatment provides a great deal of support when chewing and speaking, and is especially beneficial for patients who need prosthetics on bottom arches. While they can be removed, fixed overdentures do not slip out of place and allow patients to eat healthy, difficult-to-chew foods. Hybrid dentures combine the support of removable overdentures with the ease of screw-retained bridges. This restoration is ideal for patients who want minimal involvement in the maintenance of their smile, as these permanent teeth are only removed by us, the dentist, during routine appointments. Fixed dentures support full bite function, entirely restoring the comfort and appearance of your natural teeth. All-on-4® also known as "Teeth-in-a-Day"
For patients who have experienced bone loss caused by missing teeth, we provide the All-on-4® treatment concept. These permanent full-arch bridges are supported by four angled dental implants, requiring less vertical structure in the patient’s jawbone. With teeth-in-a-day, we can provide a full prosthetic on the same day as your implants are placed. You can leave the office with a full smile in just one appointment. If you are missing some or all of your natural teeth, contact Dr. Sorin Muntean at Muntean dentistry to schedule your denture appointment today. We provide comprehensive restorative services for patients throughout Thousand Oaks and the neighboring communities. I have been Dr. Muntean's patient for the past 8 years and every time I see him I am impressed by his thoroughness, attention to detail and amount of time he devotes to me as a patient. His technique of anesthesia is exceptional, making each encounter with Dr. Muntean completely painless. Dr. Muntean has made my dental experience very pleasant and easy. He has such a wonderful professional demeanor and style that puts me as a patient at ease. My dental outcome I am absolutely satisfied with. I would recommend Dr. Muntean and his entire practice to my family and friends.